GNLD's most powerful eco-friendly cleaning product, industrial-strength Super 10, penetrates, dissolves and emulsifies even the toughest dirts and grime. It's perfect for industrial use, yet safe in the home. Super 10 makes all your cleaning chores easier, yet it's compatible with the environment. You'll love the way it penetrates grease and stains, wipes out fingerprints, black heel marks, and soapy residue on tile and grout. You choose the strength you need for each cleaning task. It's powerful cleaning for just pennies per use. How is Super 10 Unique? Super 10 penetrates the spot or stain and gets between the surface and the dirt. Super 10 dissolves it, breaking up dirt and grease for easy removal. Gentle enough for fine fabrics, personal care. 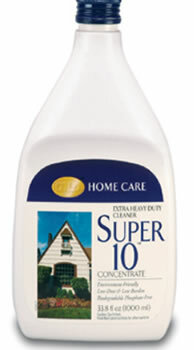 Super 10 emulsifies it into the cleaning solution for easy removal by rinsing or wiping. Super 10 has powerful reserve alkalinity, captured and contained power that becomes aggressive only when it chemically "recognizes" dirt and grime. Industrial strength, yet safe for you and your home. Harmless to any surface where it's safe to use water. 3-way action. Penetrates, dissolves, emulsifies. Versatile & economical. Does the job of dozens of specialty household cleaners at a fraction of the cost. Effective on every job from removing stubborn stains in fabrics to cleaning garage floors. Concentrated. A little bit goes a long way. Free-rinsing. Leaves no sticky residue. Nonflammable. Safe near heat or flame. 100% biodegradable. Organic and phosphate-free. Super 10 provides everyone with one cleaning concentrate that does the job of a cupboard full of ordinary cleaners, and does it more effectively! Kitchen: Spray on and wipe clean appliances, woodwork, chrome, enameled surfaces, stovetops, countertops, windows. Heavy-duty strength for stovetops, grills, fume hoods, and as a presoak for pots and pans. Bathroom: Fixtures, floors, walls, tile, mirrors. Laundry:Spot-remover for ink, crayon, lipstick and ground-in dirt and grime. Living/Family Room: Spot-cleans rugs, windows; great for dusting. Garage/Car:Vehicle engine cleaner, cleans up grease and oil spots, tools, garage floors. Use general strength for vinyl and naugahyde. Outdoors: Barbecue grills, driveways, patio furniture. Extra heavy-duty cleaning: 6 oz. plus 18 oz. water in a 24 oz. spray bottle (3-to-1). Heavy-duty cleaning: 2 oz. plus 1 teaspoon in a 24 oz. spray bottle and fill with water (10-to-1). General cleaning: 2 tablespoons plus one teaspoon in a 24 oz. spray bottle and fill with water (20-to-1). Windows cleaning, mirrors, light dusting: three drops of Super 10 in 24 oz. spray bottle filled with water. Water, oleic acid monoethanolamine & sodium salt, dipropylene glycol methyl ether, linear alcohol ethoxylate, urea, EDTA tetrasodium, sodium hydroxide, fragrance, preservatives, color, dihydeoxyethylglycine. CAUTION: Contains monoethanolamine and 2-methylethoxy-propanol. Eye irritant. If contact with eyes occurs, flush repeatedly with cold running water for 15 minutes. If irritation persists, contact a physician.